Solution: It is clear from the molecular formula and also from the given options that the compound contains benzene ring. As it gives white ppt on heating with alcoholic AgNO3, the Br atom must be linked to a sp3 hybridised carbon i.e. it is not linked directly with benzene ring. 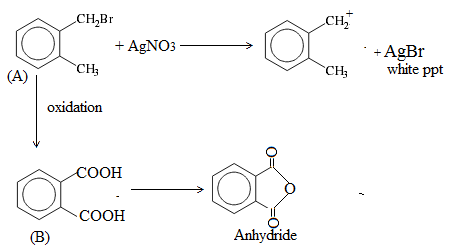 Further the formation of anhydride indicates that the two carboxylic groups and therefore two alkyl groups are present at adjacent positions. 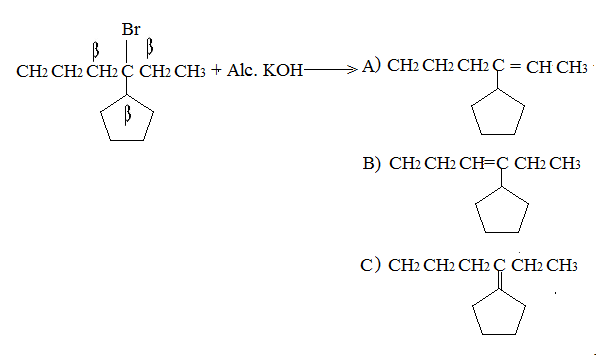 So, the only possible structure is  C.
Hence, the correct option is C.
Solution: Dehydrobromination of 3-bromo-3-cyclopentylhexane using alcoholic KOH results in beta elimination. The given molecules contain three c atoms at beta position to Br atom. Hence, three products are formed. 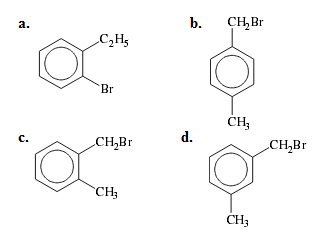 Out of these three products , A and B exist in two isomeric form each i.e. E and Z forms. So the total number of possible products is 5.